animals | six words to change the world. youtube clip of today: super chameleon! Sooooo my landlord said I couldn’t have a cat or dog…but he didn’t say anything about chameleons! HOW DOES IT DO THAT? (And here is where I answer my own question so that you don’t have to take the time to Google it yourself…click the link) I also would like to have multiple pairs of Ray-Bans. Oh and guess what song is stuck in my head now? quirky news for a sunday afternoon. Let’s talk about squirrels. Rats with fluffy tails. True story: I was once attacked my squirrels by the Vietnam Memorial in DC. They wanted our snack foods and opened our backpacks. It was terrifying. Anyway, the science wonder children at UC Davis have found the solution to their squirrel overpopulation problem– birth control for squirrels. It’s true. “This new birth control method may potentially help control squirrels or other species, such as white tailed deer,” said Sara Krause, a doctoral student in ecology who designed the plan. “If we can test a birth control method and find it safe and effective, there’s a possibility of it being a breakthrough method in both urban and suburban areas,” she said. I’m sure the Christians would rather they train the squirrels about natural family planning. On to the Big O. Nope not that kind. (Geeeeeez. Parents read this blog!) No, not Obama. (Good guess though.) I’m actually talking about Oprah. The lady’s got it going on. There are talks that O might not renew her talk show in 2011! THE HORROR. That gives us just three short years left with her. TiVO that shiz now, people. Or don’t, because it will run more in syndication than the Fresh Prince of Bel Air. Oprah’s getting her own TV network. Boringly called the Oprah Winfrey Network, or hilariously and appropriately nicknamed, OWN. Oprah owns your soul. One might go so far as to say she PWNS you. Illinois is hoping for a tourism bump due to Barack’s win. Really? Well alright. Walsh, I’ll see you soon. Ohhh the Onion. Always makes me chuckle. I can totally picture this story on Fox though. 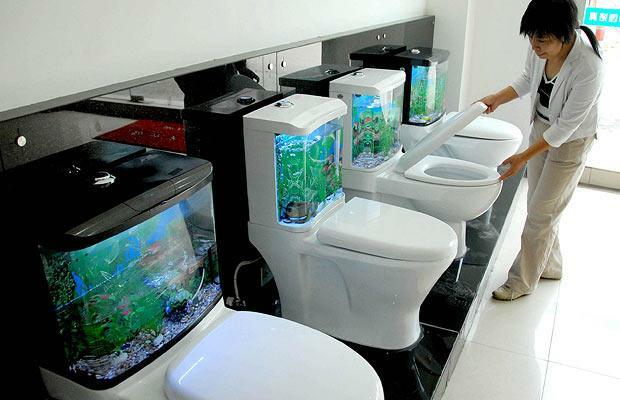 These toilets look a little fishy.